Apple's iMac: The First Z68 for Sale? Yesterday Apple introduced its first Sandy Bridge based iMacs. 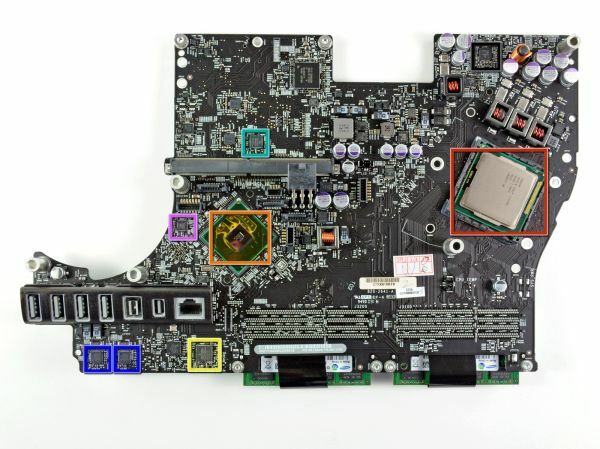 Thanks to @siromega I was pointed at iFixit's teardown of the new 21.5-inch iMac, which pointed out that the new system is actually first to use Intel's Z68 chipset - ahead of Intel's official launch of the chipset. It's a unique choice for Apple given that Z68 incorporates features that Apple doesn't seem to use in the new iMac (SSD caching, overclocking). But perhaps we will eventually see Apple embrace SSD caching in future models? Unfortunately, it does not work that way. "There’s just one hangup to all of this Quick Sync greatness: it only works if the processor’s GPU is enabled. In other words, on a desktop with a single monitor connected to a discrete GPU, you can’t use Quick Sync."